THERE’S AN EASY WAY TO TURN A DINNER PARTY INTO SOMETHING BEAUTIFUL WITHOUT THE SPENDING STRESS. A Spring dinner party menu is one of my favourite seasons to work with in the kitchen next to summer because of the vast amount of produce available. If you have a green thumb picking herbs and vegetables from your garden also adds to the fun of preparing delicious meals. Whether you are hosting a dinner party for 20 or a small group of people the number one thing you need is a list. The dreaded list BUT trust me when I say putting the list together is the easy part when creating a menu for your guests. If you think you are going to wing it the night before or even a couple of days before you’ll find you spend more money on your dinner party dishes then had you have planned in advance. Why? Because you are rushing to get it done and the last thing on your mind is- Savings. How long should I plan for a dinner party? That depends on how confident you are to complete the process. If you’re just inviting a few friends over for a casual dinner then sure you could pull that off in a day or two but if you’re hosting a large dinner party give yourself at least 2 weeks. Life gets in the way sometimes so having a window of opportunity is better than having nothing at all. I received an email from a fan who is under pressure to host a large Spring garden party. This is her first outdoor event and she was hoping to get some tips and ideas on budget-friendly dinner party dishes to serve to her guests. She also wondered if she should cater to anyone who has food allergies or special diets. The party is a 40 year wedding anniversary celebration for her parents. Since her siblings live out-of-town, she is on her own to plan and execute this party. Her siblings will arrive the day before and offer any help they can then. Last year I shared some of my secrets about “How to host a casual budget-friendly dinner party” and although this might sound similar they are very different. A casual party is something you can whip up last-minute if you had to. Grab some burgers, hotdogs and sausages, pre-made salads, chips and dip, veggies and you’re good to go. Consider the season and event type when creating a menu plan for your dinner party dishes as this will set the stage to get the ball rolling. Each season in Canada offers different menu options plus costs will differ as well depending on where you live. You’ll also want to think about how many guests you have, portion sizes per person and the budget you’re working with. I like to serve at least 2-4 starters per person so I make sure to buy enough plus extras for the hungry party-goers. Hosting a Spring dinner party is fairly easy as long as you get ahead of the process. Help with your party planning also goes a long way in keeping your sanity alive. If you find that you are alone planning a large event maybe see if a friend or relative can help out. The good news is that Spring is the perfect light jacket weather for an outdoor dinner party, even for the kids. Lucky for us we have an sun-room which is where we hosted a casual Spring dinner party. On the menu were finger foods, salads and a couple of homemade desserts. Should you accommodate food needs? If you’re planning the dinner party then you should accommodate those who need something special to a reasonable extent. If what they are asking for is out of your league you may have to ask for expert advice or get suggestions from the person about what they can and can’t eat. Aside from planning keep the menu simple especially if you’re a first-time dinner party host. The name of the party game is to party with your guests and stay away from the kitchen as much as possible unless you’re bringing food out. No one likes to be stuck in the kitchen while everyone is having fun. 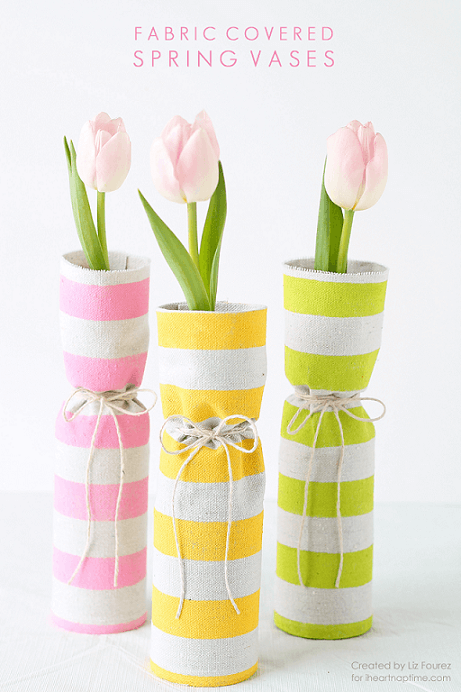 I found a really cool idea over at I Heart Naptime for these Fabric Covered Spring Vases. You can find all your supplies at Michael’s Craft Store or the Dollar Store in Canada. Set a few of these around your table and you’re sure to have a center-piece the guests will talk about. Being creative is fun especially when it doesn’t cost much to do so. Alternatively you can add a fresh bouquet of Spring flowers to the table which you can get at Zehrs for $10 in the floral department. Just about every grocery store sells some form of flowers for cheap. If you want to decorate your space further I’d suggest a trip to the Dollar store or second-hand shops for Spring linens and decor. You can’t go wrong, really it’s the best way to save money and still look like you spent a fortune on your party. Share your money-saving secrets with your friends, they’ll thank you. Let’s have a look at some of the most mouth-watering Spring Dinner Party Dishes that I know I want to try and I hope you do to. I’m sure our friends would never turn down an invite again if our party food looked anything like these beautiful dishes. The obvious here would be a vegetable and dip tray, deviled eggs, olives and cheese, crackers and cheese trays especially for a casual party. Add some Tortillas and other healthy types of snacks to bulk up the app table to go along with these two simple dinner party dishes below and you’re all set. 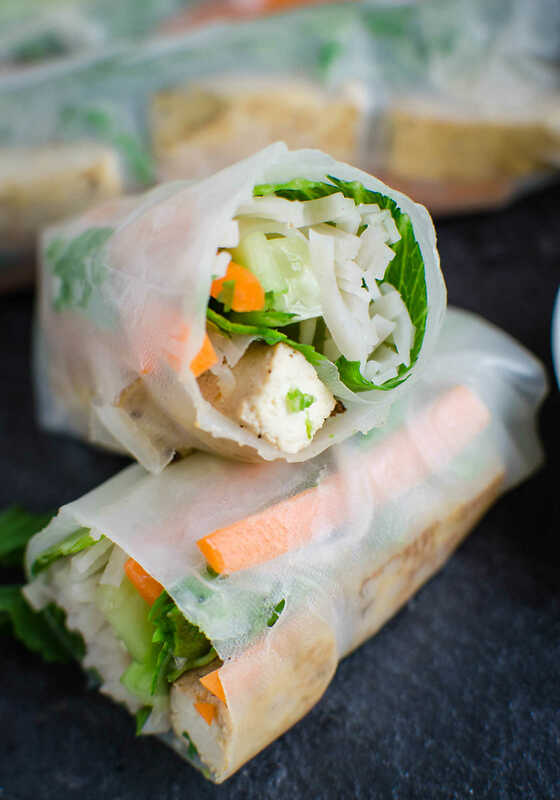 The Vietnamese Vegan Spring Rolls over at Watch What You eat are the perfect Spring recipe you should add to your Dinner party starters menu. This is a wonderful meatless option that is not heavy before the main dinner. 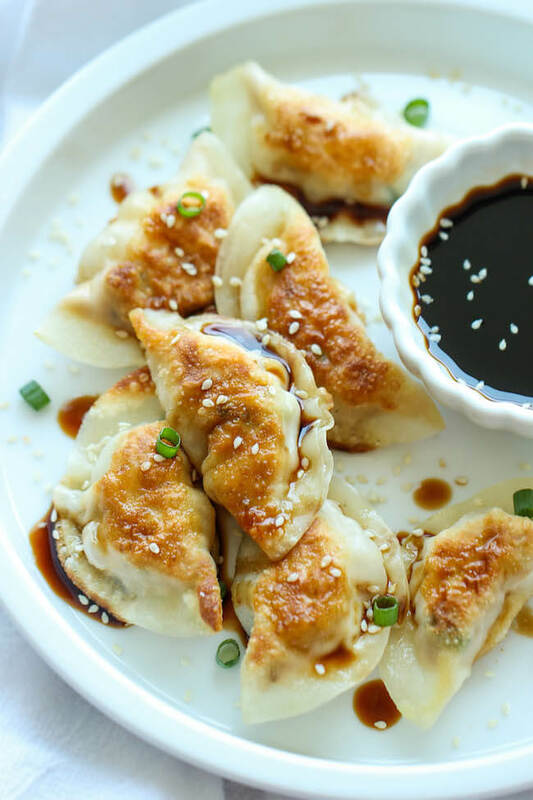 Sesame Chicken Pot Stickers are a wonderful deep-fried starter idea for your Spring dinner party. They’re stuffed with chicken, elegant shiitake mushrooms, garlic, ginger and just a full-flavoured app. This recipes offers a nice balance with the spring rolls in texture and flavours. Serve your pot stickers with a side of dipping sauce. 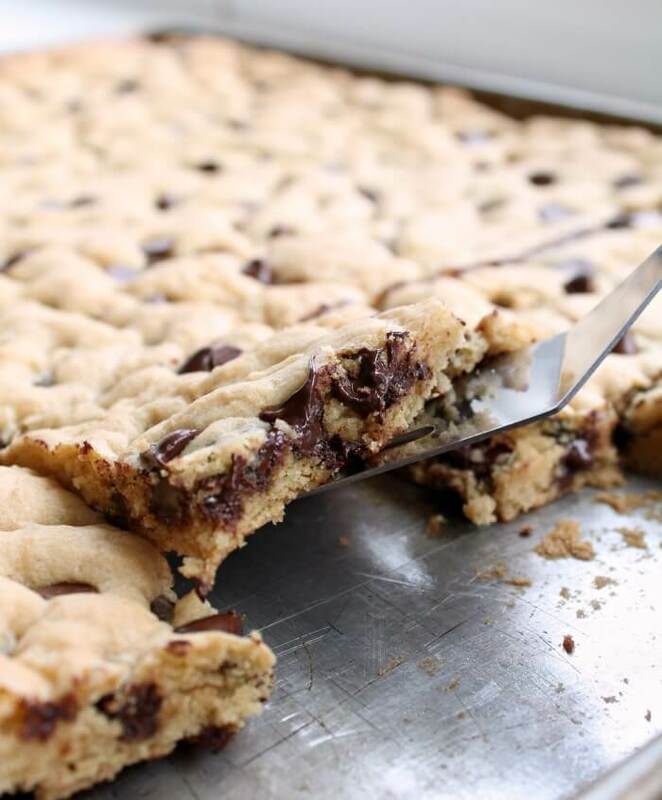 The cool part- You can batch make this recipe and freeze them in advance for your party. Pot-stickers are unbelievably easy to make. Best of all, they’re freezer-friendly, perfect for those busy weeknights! Would you just look at the beauty on that plate! 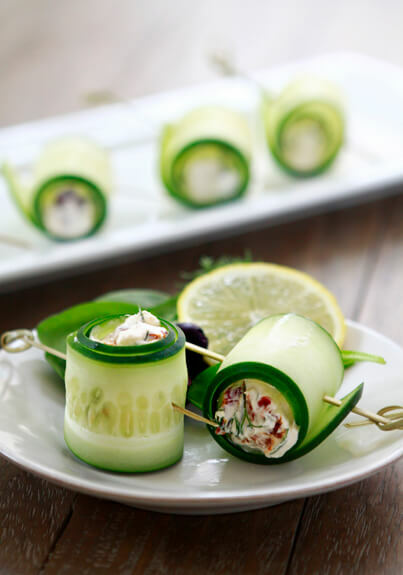 Cucumber Feta Rolls are PERFECT starters and you can find cucumbers for under a buck in the Spring which means this recipe makes the menu cut. 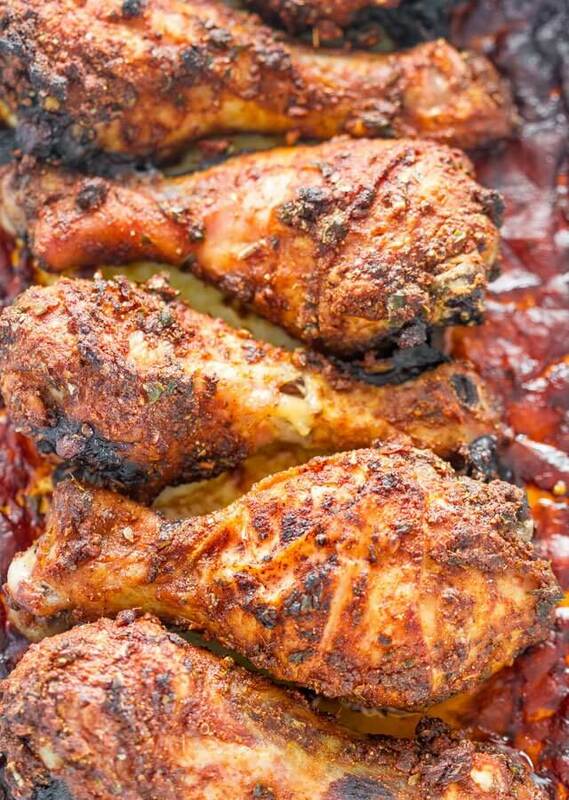 Fire up the grill and prep this amazing looking Garlic and Paprika Chicken. What I loved about this recipe is that we’re using inexpensive poultry cuts but adding tonnes of flavour. Your guests will appreciate that you went the extra mile to flavour and season your chicken so it’s not bland or dry. The colour also adds depth to the other dishes you will serve plus it keeps the menu lighter. I often find beef can be heavy especially if accompanied by bread products. 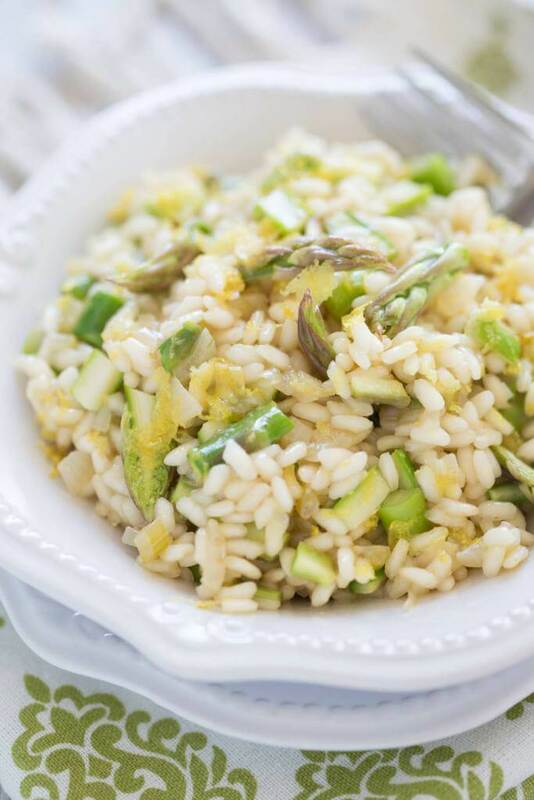 For the vegetarian dish you could make this beautiful Asparagus Lemon Risotto from the Garlic Matters website. I love asparagus and am a huge fan of lemon so I know I’d love this recipe and hopefully our guests will too. The Spring months is when you will start to see asparagus come down in price. During the months of May, June and July asparagus are in season and priced as low as $1.99lb or free if you know where to forage for them. 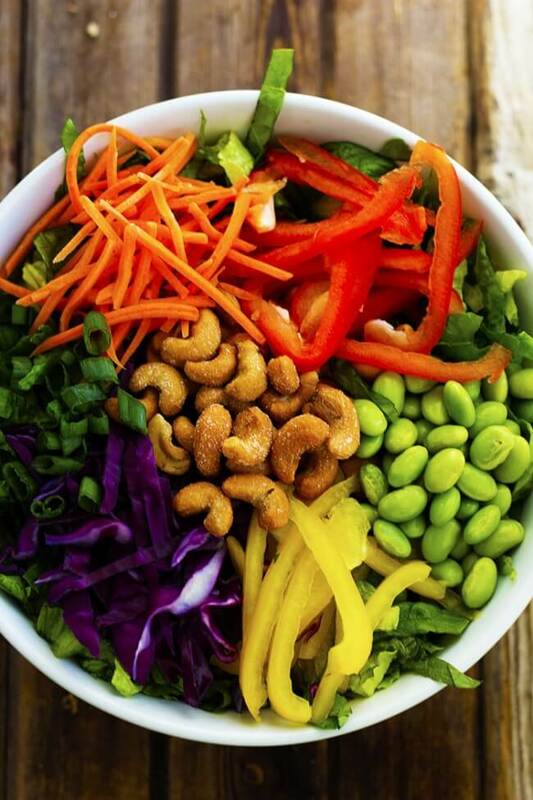 Add all the colour you can in your salads. Salads have become the new party meal with more and more people experimenting with flavours and textures. I love to add pumpkin seeds to my salad for a bit of crunch and ditch the croutons. The options are endless which is why hosting a salad bar Spring dinner party is a popular menu. 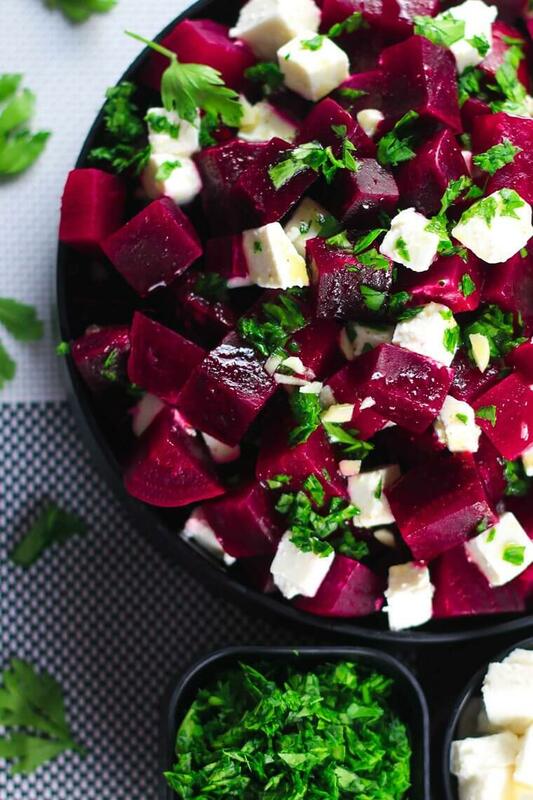 Beetroot and Feta Cheese Salad by Scrambled Chefs is colourful with a full-depth of flavour from the feta cheese. Buy the good feta as a little goes a long way. Money Savings…remember? Frugal Spring dinner party dishes don’t have to include an abundance of ingredients to be successful. Keeping it simple also means lowered costs. The Recipe Critic won me over with their Thai Cashew Chopped Salad with a Peanut Sauce dressing. The colours are vibrant and loaded with in-season produce. This is one of those salads that could eat like a meal. Add some salmon, chicken, beef or pork and you’ve got a match made in heaven. 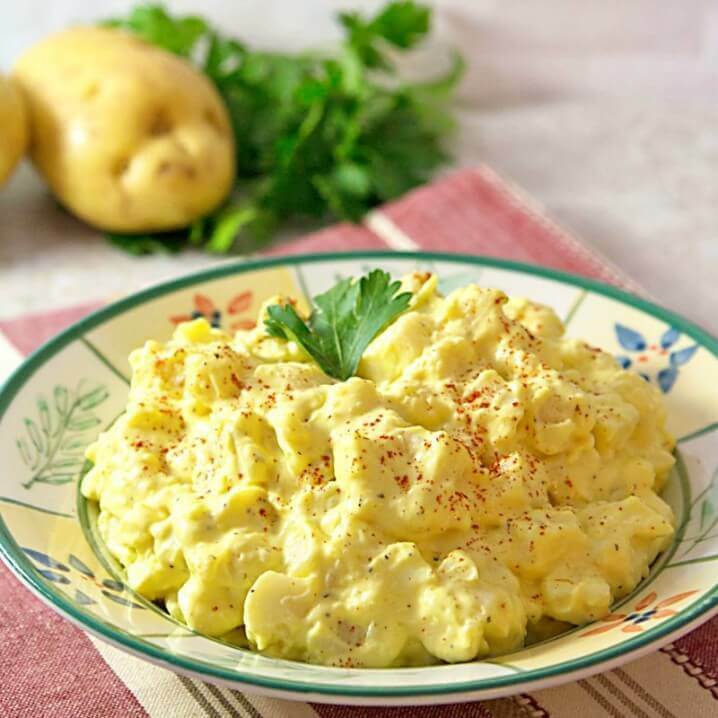 One more… couldn’t resist this Southern Style Mustard Potato Salad. So simple and pairing mustard with potatoes is a perfect idea. If you’re cutting the carbs substitute the potatoes for radishes and you’ve got yourself a low-carb mustard radish salad. 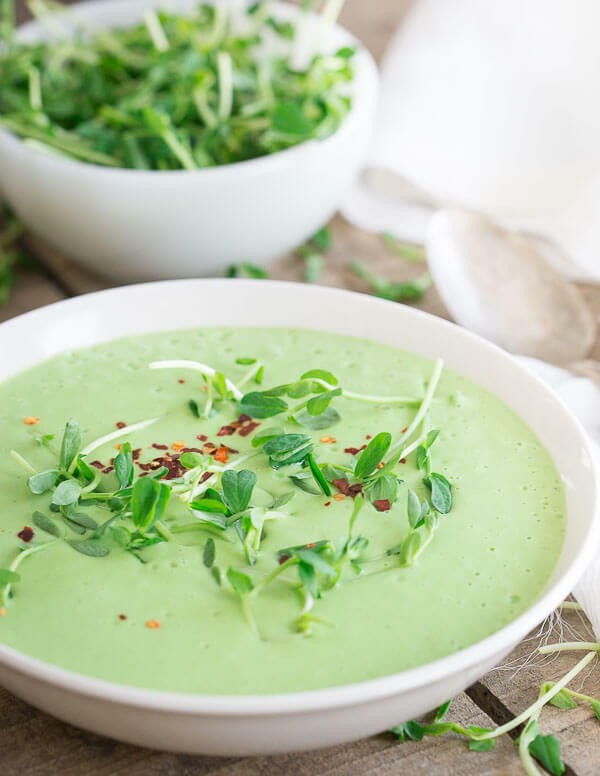 Thai Pea Soup is a recipe that your guests will rave about especially if it looks like the photo above. Not only can it be served at room temperature or hot you make this wonderful soup in the blender. Talk about Kaboom with freshness. 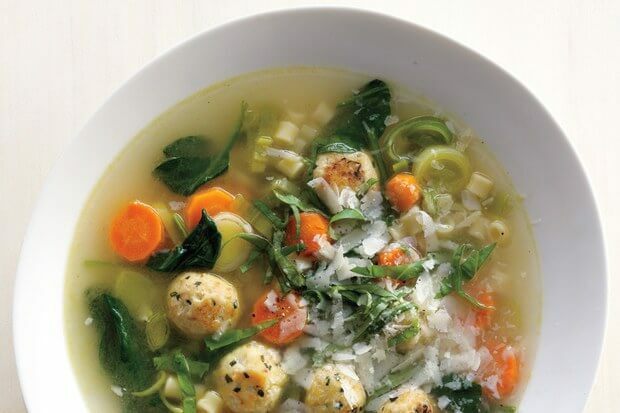 The other Spring soup recipe that I would definitely add to a party menu is this Spring Minestrone with Chicken Meatballs. Not only is it cheap to make but it’s bursting with flavour and is a broth based soup. The Spring is still a bit nippy in the evening so a nice bowl of soup will hit the spot for your guests. Keep it warm in the crock-pot and serve the entire dish outdoors. I’d also offer a seasonal fruit parfait with a sugar-free whipped cream for those guests that want something sweet but without all the calories. 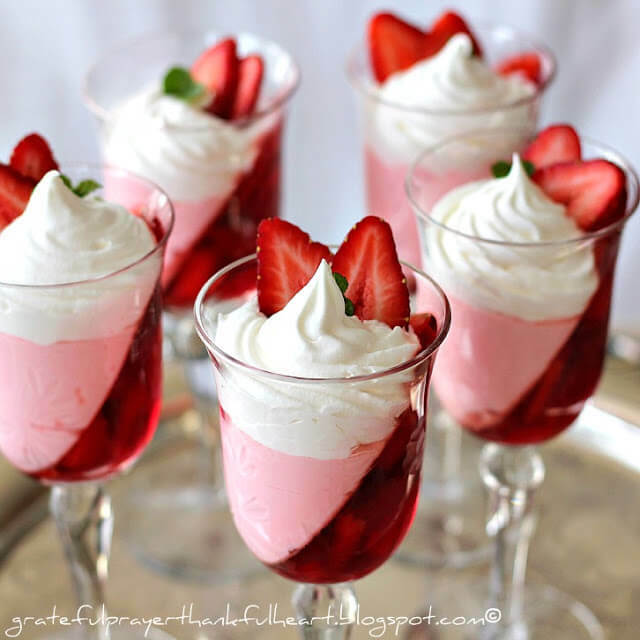 How can your guests say no to a lovely Sugar-free Strawberry Jello Parfait? In the Spring you can also find great deals on blueberries, blackberries and raspberries. Mix them all up or try different variations. Simple and very inexpensive for dessert. 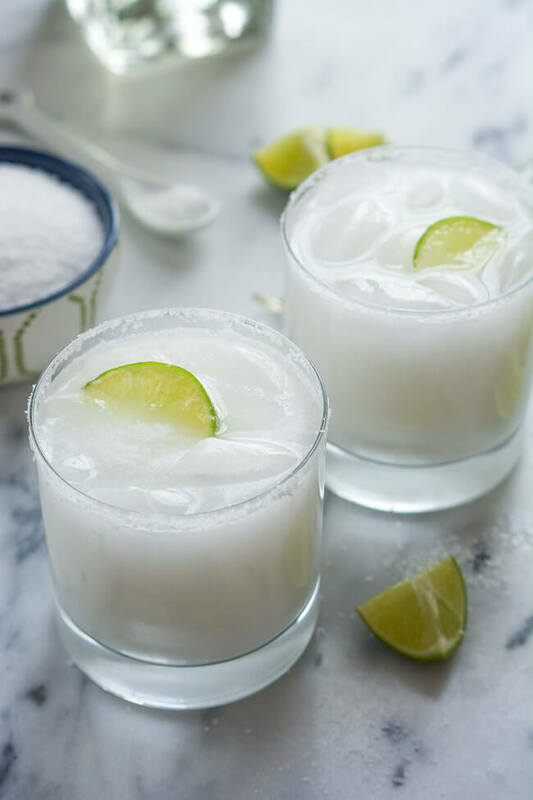 A skinny coconut margarita is a perfect Spring drink to serve with your meal or as the guests arrive to your dinner party. Keeping the drinks simple and light won’t fill your guests up before the appetizers and main meal. 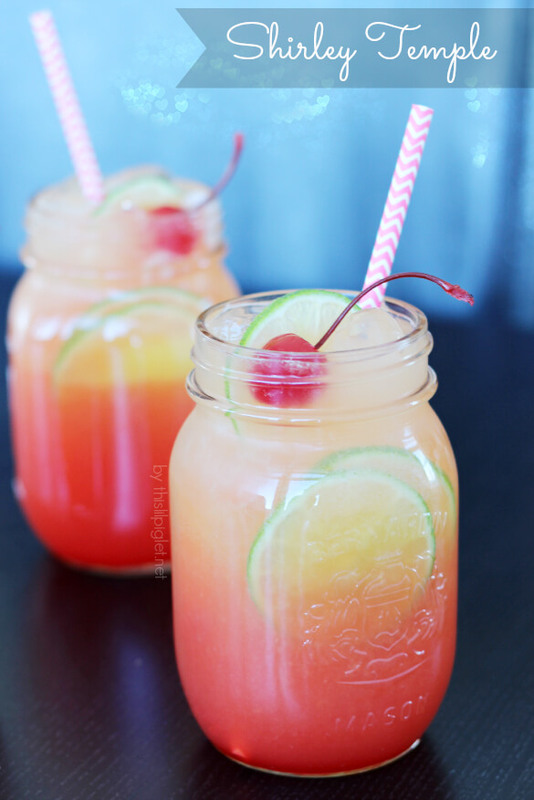 Over at This Lil Piglet their non-alcoholic Shirley Temple drink is a colourful beverage that your guests will love. What I like about having two options for mixed drinks is that you get to choose whether you want alcohol or not. Obviously non-alcoholic drinks will cost less. Offering your guests other options such as water, pop, fruit juice, sodas, beer and wine are also suggested since not everyone drinks alcohol. You don’t have to hire a band for entertainment at your party simply turn the radio on and offer your guests some light party music. Another fun option is to host a Spring karaoke party to involve all of your guests. Cost $0. Budgeting for any kind of dinner party can be tough especially if you haven’t saved the money up. Saving by watching sales flyers in advance will help to cut costs as long as you’ve got that window to do so. Hosting parties any time of the year will cost you money but for most people they enjoy the company of others and can do so without spending more than they need to. Plus, eating out is far more expensive. P.S- Test your recipes in advance if they are new to you because you don’t want to be learning how to make your Spring Party Dishes the day of the party. I hope these recipes and tips help my reader and other CBB fans who are looking for Spring inspirational dishes for their party menu. 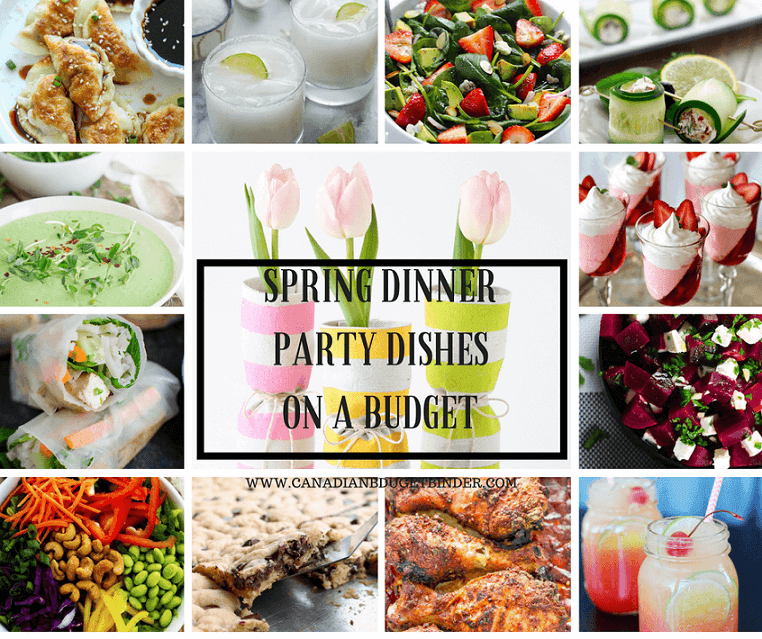 What are some of your favourite budget-friendly Spring Dinner party Dishes? After our son fell and bopped his head on Monday we made a pit-stop for food from Zehrs as there was no time to cook our menu plan when we got home. We did find some great deals but now we’re really done for the month. Those pink stickers on the meat were hard to resist. In the event we run short of something the last week which we shouldn’t I still have a $50 PC gift card from Christmas or plenty of PC points. Weekly Overview (your final thoughts): Posting the month-to-date all at once, didn’t get a chance to post mid-month. So far, on target. I have been buying at PC to get the points, focusing on what is on their points list, sometimes I pay full price. I earned $20 in points this month, so theoretically that could be deducted from my total? We’ve been shopping PC lots lately as well as we love the PC points. It could be deducted IF you want the choice is yours how you want to document it. We just take it off as we spend it. Some of us use points in other ways. I think Mary can better explain that as she does it differently. THe first item… impulse buy. Did you feel guilty about the purchase so you put it first on the list to get it off your chest? I know what that’s like we go through it EVERY week but mostly with 50% off deals that are hard to pass up. What do you use the SILK coconut milk for? Do you buy coconut milk in the can as well? You can apparently make whipped cream with it too. I might try that. Mmm Smoked hams and Bacon! Was that a bulk package deal? What did you get for it? What are you making with the blueberries for your dinner party? It’s always nice to see a full month in one view. You have some great deals this month especially the meat! Well done. What have you learned so far about your shopping habits in 2017? Not important but wanted to offer that Lantic of BS from Independent receipt is the brown sugar. Had the same thing on my receipt and it took me a while to recall what in heck that was. Overview: Nothing new as it’s a quiet week. Was able to make another payment on the debt so it slowly dwindles down. YES for debt repayment! That’s great news DEE. I love your updates. Our son is made about raisin toast and toast now so hopefully we can find some bread with pink stickers this week. 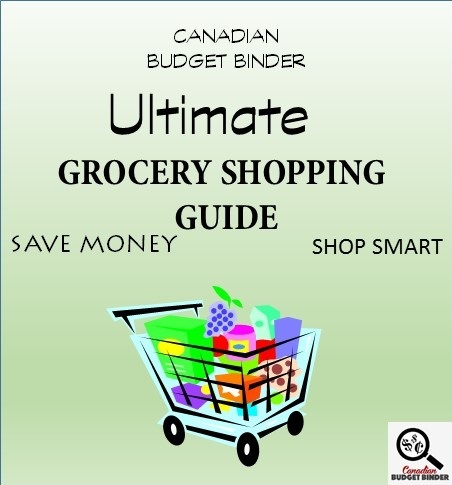 How’s your year been going so far with your grocery budget? Spending more or less than you’d like? Changes? It’s interesting to notice the change now that we document it. You get ballot #8. Mr.CBB Have a great week. The grocery budget is okay. Any money that I use for debt or such is deducted so it makes the ending balance more realistic. I wouldn’t say that I’ve changed much since I’ve started recording the purchases. Have you found it easier to track the expenses though or were you doing that all before? I’ve always had some form of budget but didn’t really track the expenses before, just what needed to be paid and when. It’s easier to see where the money is going now, especially now that my co-worker helped me with making my budget more intuitive. Brilliant that’s great!! 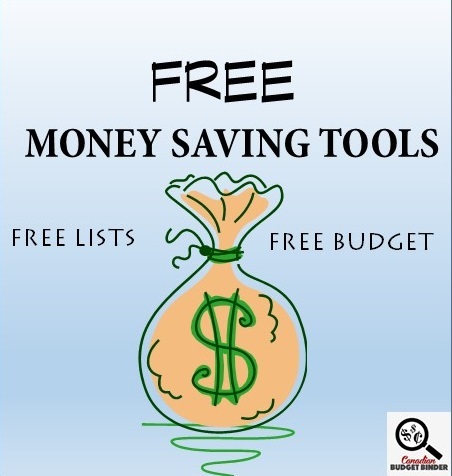 What did you find difficult about the budget you were using? Did you make your own budget? I did make my own budget and it has evolved over time to include different categories that I want/need to see. The previous budget had all the values for the different purchases in one cell but no details, so I didn’t always know if I included everything. Now the budget is much more detailed and is set-up to have an “input” sheet and with the use of a formula, will take those values in a “sum” factor and add it to my “output” sheet. If I need to add a new category, it’s very simple process. I have looked at doing pivot tables for my output but they didn’t have the layout that I wanted. The best part is that because I was part of the process of the new budget format, I can take the 1st stab of debugging any errors before going back to my co-worker for assistance. Once again, I am thankful for this site! Paying attention to one’s money is so important, and I had not been paying attention. Cheers! Thanks for the kinds words about CBB. 🙂 I’m glad you like it here. There are so many readers out there and I love to get their feedback. I’m guessing Anne is your daughter. So every once in a while you jump in and help her out with groceries which is what you did in your first GGC post. 🙂 Have you found the price of cauliflower going up again? We have which is why we haven’t bought it in a couple of months. I hope it comes down a bit as we use it for so many things low carb. What have you learned so far in the past 2 GGC posts? Keep at it…. you’ll be a whiz in no time. Hubby and I had a great 4-day Easter weekend together just chilling out at home but now it’s time to get back to the everyday grind. It’s okay though…our vacation days are coming. This year hubby has 5 weeks + Stat. holidays to use because he gets an extra week on each of his 5th anniversary years at work. Next year we’ll be back to 4 weeks of vacation again but hey…that can feel like lots if you plan them right. It’s a NO SHOP WEEK for us this week. I hire a gardener to do the fertilizing & weed control on the lawn, moss removal, the spring clean out of the garden beds and planting the 50+ annuals out front & in our cedar planters out back, cutting back all the bushes, trees, perennials and hedges and every 2nd year they power wash and stain the fence and planters. I save the weekly grass cutting and the annual staining of one side of the house for hubby. I have a maintenance contract with Orkin Pest Control to deal with any ants, wasps or woodpecker issues so hubby doesn’t have to. Pests are fine but keep them outdoors and get rid of the wasp nests please! The pest control contract is a must have because we seem to have an abundance of wild life in our yard…last night it was a big fat racoon and two nights ago it was a heron. Over the years, you’d be surprised what has been in our yard…coyotes, a fox, a cougar just to name a few. We are close-ish to the river and the mountains so it quite the menagerie! One year we had to call them to get a squirrel out of the rafters before it did any damage. I get hubby to change the furnace filter every 3 months but the regular maintenance and servicing of the furnace and heat pump are contracted out to Sears. I am in charge of the cleaning of the washer, dryer and dishwasher but hubby cleans the out the lint from the outdoor duct, as it requires a ladder. I also have a service contract with a plumber but fortunately we don’t have to call him in very often. Even when hubby retires, I don’t really…I still handle all of our finances and run our company from home 7 days a week. That isn’t going to change. It runs in my family though – Dad’s 86 and he still works full time 7 days a week. 🙂 Hubby just won’t have to spring out of bed quite so early in the morning. What I will do though is teach him all that is involved in maintaining all of our assets and records, when he has the time & energy to learn, so that he can have a seamless transition if I happen to go first. I am taking into consideration his age though – so the next time we replace the roof, I will also have the gutters re-done with the low maintenance variety that don’t require as much cleaning. I would prefer that he not be swinging off a ladder any more than absolutely necessary. Eventually, I will contract out the staining of the house and get him off those two story ladders completely. No you don’t need to report when you are going to be away to the insurance company but check your policy about how long you can be away without hiring someone to monitor the place. All they have to do is check with the neighbors as to how long you have been gone and the insurance company could feasibly deny a claim if you had one while you were absent for an excessive period. I’ve never had a claim but it’s better to be safe than sorry. The next door neighbor is a “Snowbird” but they have a son living in town that comes once a week to check on their home when they are vacationing. As we don’t have children, we’d have to hire a management company to do the job. Our Travel Medical insurance specifies coverage is for a maximum 30 day trip, for as many trips as we want, over the course of a year but we must return to Canada in between our trips. You can buy additional coverage to extend your stay if you need/want to but we’ve never found it necessary. The time I would want to be away for longer would be Jan-Apr during the lousy weather but that’s my busiest time of year what with the corporate year-end, personal & corporate taxes, RRSP and TFSA contributions. It is also worth noting, it’s important not to exceed the maximum number of days outside Canada…required to maintain your residency status for the sake of medical coverage and income tax. I keep records of all our annual travels and can support my claims including date, time and location of any border crossings..